Since it's a new year, it's time to start a new routine- that always goes so well. Right. But really, I'm going to make the effort to be healthy (good thing you all can't see me eating this giant Toblerone bar). So I'm joining the 100 Mile Fitness Challenge hosted by Trish. 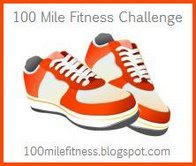 In order to complete this Challenge, you will need to “travel” 100 miles from January 1st through March 31st. *Running or walking 1 mile outside or on a treadmill equals 1 mile. *15 minutes of other workouts equals 1 mile (elliptical, swimming, weight lifting, workout video, workout classes, etc.). I had to check my treadmill because I couldn't remember if it was miles or kilometers. It's in miles so that makes calculating a little easier. And today I did 20 minutes on the Wii Fit Plus . Yay! That's 1 mile down, 99 to go! I'm going to have to make up a chart or something though or I'll never remember my mileage. Want to join? Come on you can do it! I really should sign up for this, but I'm not very motivated to walk when it's so cold outside (or when it's hot out, now that you mention it.) Good luck! YAY! I joined in on this challenge as well. You go girl! I did my mile today too. Normally I'd do two, but I like to start slowly;-) Good luck! I'm in this one with only mile logged too. We can do it! Yes! I want to do this - need to do this! I would kill for some toblerone right now. :) And yes, even at 8:30 in the morning! Thanks for signing up for the challenge, Chris. Anyway, best wishes to you.